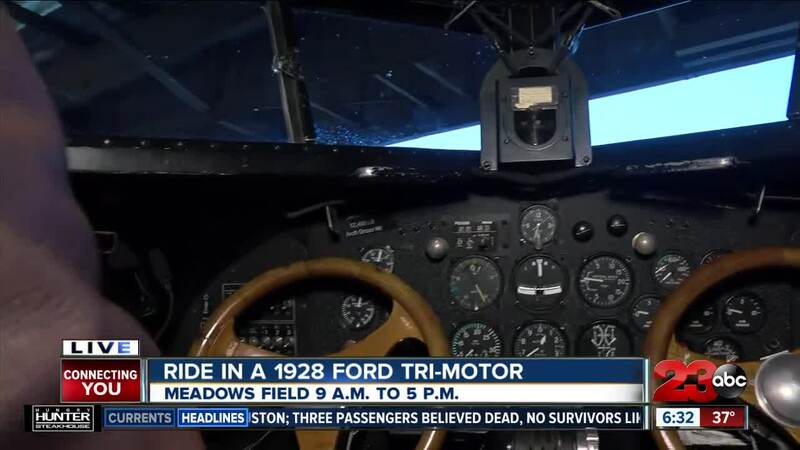 1928 Ford Tri-Motor is flying people over Bakersfield February 22-24. It was the first mass-produced airplane for commercial travel. BAKERSFIELD, Calif. — You can experience the 1920s luxury aviation as an immaculate 1928 Ford Tri-Motor will be touring the country and offering the public the chance to experience what it was like to travel in the early days of what was considered "luxurious commercial air travel!" The Tri-Motor can carry up to 10 passengers at a time and every seat has a window. Passengers are encouraged to bring a camera to record the experience. Tickets can be purchased in advance for $70 for adults and walk up tickets are $75 for adults and $50 for children 17 years and younger. Thursday, February 21 from 2 p.m. to 5 p.m.
Friday, February 22 through Sunday, February 24 from 9 a.m. to 5 p.m.
To book your spot, click here .